Who Doesn’t Love To Pamper Themselves With Great Smelling, All... – Juka's Organic Co.
Our red palm oil soaps are filled with nature’s anti-oxidants to promote anti-aging and hydrating properties to keep your skin blemish-free, moist, firm, pearly smooth and youthful. Continuous use of our organic lavender red palm oil soaps over time will result in softer and healthier skin. We bring this ancient African secret to cure all your skin problems. 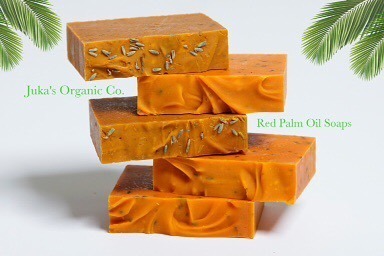 Continual use of red palm oil soap is great for eczema, acne, psoriasis, boils, dry skin and dermatitis.